The green peppers in this recipe are a wonderful contrast to the sweetness of the mango. A satisfying dish, it takes 10 minutes to cook. Tip the lamb into a large bowl. Finely chop the salad onions, reserving the green parts. Add the chopped white part of the salad onions to the lamb with the garlic, coriander and a little seasoning. Mix well until combined evenly. Divide the mixture into 8 equal portions and shape each into a flat cake. Heat the oil in a large frying pan and gently fry the burgers for 3-4 minutes on each side until cooked thoroughly. Meanwhile, make the salsa. Halve the mango and remove the stone. Cut away the skin and chop the flesh into small pieces. In a bowl, mix the mango with the lime zest and juice, green pepper, sugar and the reserved green part of the onion. Warm the pitta breads, either in a toaster, under the grill or in the oven. 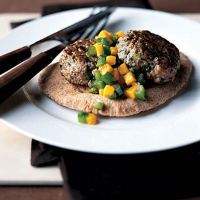 Serve with the burgers and salsa. This recipe was first published in January 2006.